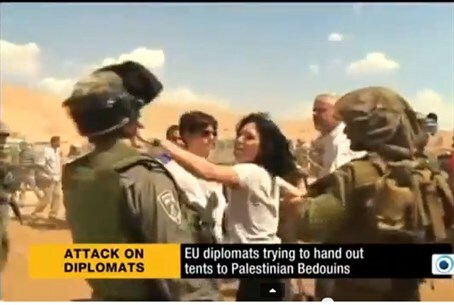 French diplomat hits soldier who prevented ‘humanitarian aid’ shipment to illegal Bedouin encampment. Tensions between Israel and the European Union over the EU boycott of Israelis living in Judea and Samaria (Shomron) may be exacerbated by a new incident in which a French diplomat struck an IDF soldier. The incident occurred as IDF soldiers stopped a “humanitarian aid” shipment of tents and other supplies that were headed for an illegal Bedouin encampment. The equipment was to be sent to Bedouin and foreign activists in the Jordan Valley whose illegal encampment was destroyed last week after the High Court of Justice, Israel’s Supreme Court, ruled that the structures were built without proper permits. The Bedouin claim they have lived in the area for generations. The Israeli government has dismissed such claims as politically-motivated, noting that there are no traces or historical records of any previous Bedouin settlements in the area. The Bedouin, along with foreign activists, have been trying to maintain a tent community at the site, with the ultimate goal of rebuilding the illegal homes. Soldiers confiscated the EU tents and other aid, eventually resorting to riot dispersal methods after some activists attacked them with rocks. Initial reports of that incident triggered a stern response from the EU. “EU representatives have already contacted the Israeli authorities to demand and explanation and expressed their concern at the incident,” said a statement from the offices of EU foreign policy chief Catherine Ashton and Humanitarian Aid Commissioner Kristalina Gergieva. “Israel rejects the one-sided announcement which was published by the spokespersons of HR Ashton and Commissioner Georgieva regarding the events in the Northern Jordan Valley. This announcement ignores the European diplomats' blatant violation of the law, their disregard to a ruling of the Israeli court and their unnecessary provocation under the alleged pretext of humanitarian aid,” the ministry said in a statement. A ministry spokesman said Israel may complain to France regarding Castaing.